At some point before you begin the recipe, fry up four pieces of bacon and save the grease. Also, make sure you have some cooked rice on hand. One hour before you begin cooking, take the tofu out of its packaging and put the tofu between two plates. Put the cast iron pan on top of the second plate. Drain the tofu at intervals for an hour. Once the tofu is properly drained, slice it into 1/8 inch slices and turn the heat under your cast-iron pan to a little higher than medium. Fry the tofu in the bacon grease for about five minutes a side. Meanwhile, rinse your chosen green vegetable and tear it into little pieces. Once the tofu is fried, remove it to a serving plate and reduce the heat on the cast-iron pan to about one notch below medium. Saute the greens until they look a little wilted to a little burnt, depending on your personal taste. Put the greens on the serving plate next to the tofu. Finally, add the rice to the pan. Pour 1 tsp wheat free tamari and 1 tsp fish sauce (per 1/2 cup of pre-cooked rice) into the rice. Stir. While the rice is frying, rinse and slice up one celery stalk per 1/2 cup of rice and add to the pan. Saute for about three minutes more, until the celery starts to soften. (The rice will stick to the pan a little. Sorry about that.) Finally, chop up one spring onion per plate for garnish. 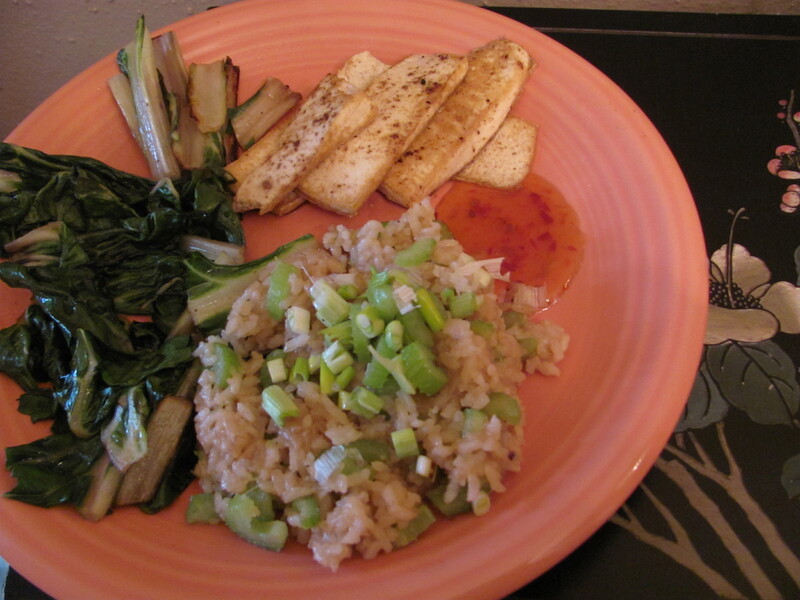 Put the rice on the serving plate next to the sauteed greens and fried tofu. Place the chopped spring onion in the center of the rice for garnish and add sriracha sauce to the edge of each plate.